The LHSAA (Louisiana High School Athletic Association) allows school principals to make decisions regarding student participation in the National Anthem while competing in athletic contests and games. 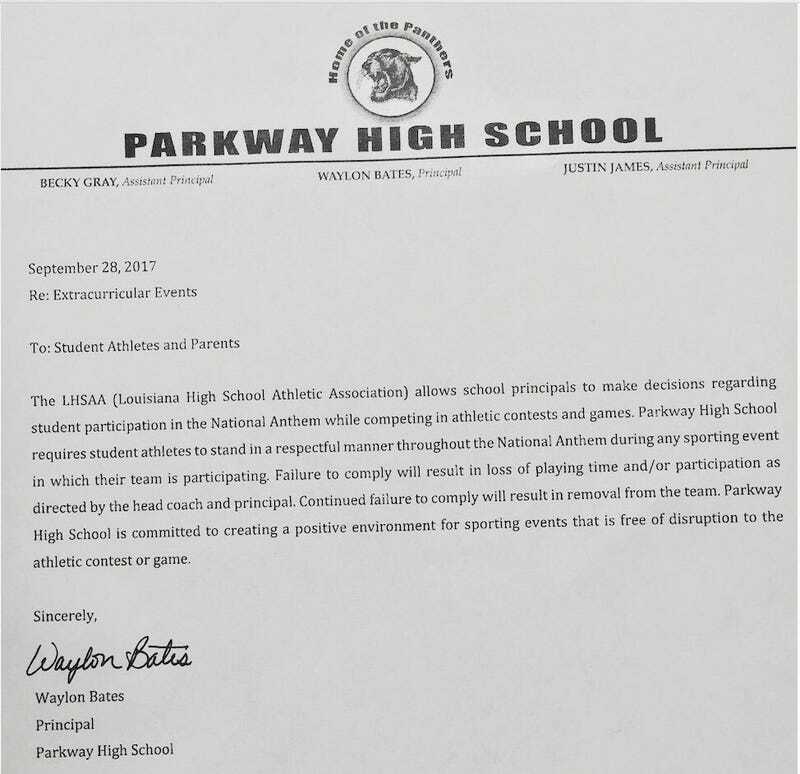 Parkway High School requires student athletes to stand in a respectful manner throughout the National Anthem during any sporting event in which their team is participating. Failure to comply will result in loss of playing time and/or participation as directed by the head coach and principal. Continued failure to comply will result in removal from the team. Parkway High School is committed to creating a positive environment for sporting events that is free of disruption to the athletic contest or game. Nearly 75 years ago, the Supreme Court rightly held that state schools have no business forcing students to stand for patriotic rituals. The Court also reminded public school administrators that part of their job is to train students for participation in our free society. This principle holds no less true today, and no less true on the playing field than it does in the classroom. Schools have no valid interest in turning their students into mouthpieces of government speech, full stop. Indeed, schools should respect students who embrace their constitutional rights and stand up to injustice – not punish them. And it would be patently unconstitutional for the school to do so. Bates should take a cue from Donald Trump and realize that attempting to stamp out the right to protest only encourages more people to protest.